Photo courtesy of Tana Hicken and Studio Theatre. on Monday, September 15th at 7 PM at Everyman Theatre – 315 West Fayette Street, in Baltimore, MD 21201.
and on Monday, September 29th at 7 PM at The Studio Theatre – 1501 14th St NW, in Washington, DC 20005. “Tana Hicken was a singular artist. A great actress. A citizen with true beliefs. A beautiful woman deeply loved by her husband, Donald. He has asked Holly Twyford and I to organize a tribute to Tana for our community. It will be on Monday, September 29th at 7:00 p.m. at the Studio Theatre. “Although I did not know Tana Hicken personally, I was stunned and saddened to hear of her sudden passing. It seemed just a short while ago that I marveled and laughed at her witty and wiley performance in The Studio Theatre’s production of 4000 Miles by Amy Herzog. Prior to that play at the same theatre, I witnessed her precision and passion in Athol Fugard’s The Road to Mecca. I moved to the DC area from NYC in 1980 and ushered at and attended innumerable productions over the years. Immediately, I knew that this actress was quite a unique force who would transform herself countless times before my eyes. When I first saw her at Arena Stage, Tana Hicken impressed me as a talented, wise, gutsy, powerful, down-to-earth yet graceful and agile actress and that perception remains. Regardless of the role, it was obvious that she had an uncanny ability to take on a new persona totally convincingly with incredible naturalness. The deft and compelling energy that Tana Hicken shared in a classic or modern play hit me hard at every performance and I looked forward to hearing and watching her each time. I just learned that she loved nature and was involved in significant social issues – and that fits perfectly with my image of her. Grant Harrison and Tana Hicken in ‘4000 Miles’ at The Studio Theatre. Photo by Scott Suchman. I’m still trying to process this loss, as I’m sure all of us are. Tana played my Grandmother in Amy Herzog’s play 4000 Miles last spring at The Studio Theatre and it was only until tonight, looking over my script for that production and reading the words we spoke to each other that grief shook me and this loss began to make its way in. Tana gave of herself as an artist and as a friend, and I learned from her how to become a consistently good actor, but more importantly, I learned how our friendship fostered the art we created together. I will always be impressed by Tana’s stories as a young freedom marcher on Washington and I admire the socially conscious life she lived. She was so passionate when telling those stories and it was wonderful to listen. There are so many things we will all miss about her and I will always remember her laughter. There are those private moments actors share only with one another just before the curtain rises and the audience settles in… it was a privilege to have shared those moments with a woman so humbled, giving and effortlessly graceful. Looking back on it, it’s difficult to fully recall where our friendship off stage separated from our life together onstage…I’d like to think they became one. “The only way for me to describe it is to say that either being on stage with Tana, or watching her incandescent performances, drew me directly to the very personal place inside me that drew me to theatre in the first place. Ruth Draper, speaking on the experience of live theatre, once said that an actor is an artist who sculpts in snow. But as I write this and think of all that Tana gave me, I have no doubt it will stay with me always. The following tributes are posted on Everyman Theatre’s facebook page. I thank Laura Weiss for allowing us to republish them here. “Tana Hicken was quite possibly the finest stage actress I’ve witnessed in my entire life. Her ability to transform completely was truly astonishing. She was deeply committed to her craft and to humanity. Tana was such a principled person forever adopting wayward and abandoned dogs, cats, and people for that matter. She was a tireless advocate for the underprivileged and for her profession. She was generous in so many ways. She donated performances to Everyman Theatre in its fledgling days when it couldn’t afford to pay her. She baked brownies and cookies to sell at our little concessions table to help Everyman keep the lights on. As a student at Catholic University in the 1980’s, Tana mesmerized me with stunning performances at Arena Stage as Mary Tyrone in Long Day’s Journey, Hedda in Hedda Gabler, Mrs Alving in Ghosts, among many others. In many ways, her work and the work of the resident company at Arena Stage were the genesis or inspiration for me to found a professional theatre here in Baltimore with our own resident company. Watching her work at Everyman Theatre creating her Eleanor of Acquitane in The Lion in Winter, Amanda Wingfield in The Glass Menagerie, Miss Helen in Road to Mecca, and Emily Dickinson in The Belle of Amherst, I learned about her tireless pursuit of the truth in performance. I received a master class in actingt. I saw how a great performance was crafted moment by moment, every word of text explored, every bit of subtext mined, every iota of symbolism lifted off the page forever etched in the minds and imaginations of the audience. She was extraordinary. Photo courtesy of Everyman Theatre. Everyman owes a great debt to Tana Hicken and her family. This photo was taken at the performance honoring Donald’s great contributions to Everyman as a director. Caitlin too has contributed to Everyman as its first Education Director. We hold you close to our hearts Donald and Caitlin as we remember and pay our respects to Tana Hicken. “Tana’s deep pool of emotional truth, finely honed theatrical intellect, and unceasing demand for the truth of the moment not only made her artistry mesmerizing – they raised the caliber of the work of all the artists around her. I had the privilege of acting with Tana several times, and on two occasions she played my mother – as Eleanor of Aquitaine in The Lion in Winter and as Amanda in The Glass Menagerie. They are two of the most profound artistic experiences of my career. I will truly miss her artistry…. I will miss her warmth, her grace, and her spirit much, much more. “It has been a great pleasure to have worked on a number of plays with Tana Hicken’s provocative acting and with Donald Hicken’s meticulous directing. The Glass Menagerie is my favorite play and Tana’s portrayal of Amanda was memorizing. Her ability to move through such a complex assortment of emotion from moment to moment demonstrated such powerful skills. “I am still shocked about the sad news that Tana Hicken has passed away. Here was an actress whose work touched me so deeply, so I pondered what to do on this website. Should I write an obituary? Should I write an article about her life and work? Others have done both already since her untimely passing. So I decided to reach out and ask her friends and colleagues to speak from their hearts. And they did and I thank them so much for doing so. I will miss you on the stage. You touched me and so many other theatregoers and we will miss you immensely. Your performances will live on forever in our hearts and memories. “We lost one of the great ones in the Baltimore/Washington area last night, Tana Hicken, who past away in her sleep. A friend reports that Tana contracted a rare degenerative muscular disease last month that attacked her lungs. Tana starred in only one show at Theater J, but what a performance it was: Jerry Whiddon’s production of Neil Simon’s Pulitzer Prize winner, Lost in Yonkers. Tana Hicken as Grandma Kurnitz and Holly Twyford (Bella) in ‘Lost in Yonkers’ at Theater J. Photo by Stan Barouh. There wasn’t a more fiercely realized performance in her estimable career than what she shared with us in her portrayal of Neil Simon’s flinty Grandma Kurnitz, seen here with Holly Twyford (photos courtesy of Stan Barouh). Max Talisman (Artie), Tana Hicken (Grandma Kurnitz), and Kyle Schliefer (Jay) in ‘Lost in Yonkers’ at Theater J. Photo by Stan Barouh. “In my short career, I have been lucky enough to work with many great actors from show to show -people who inspire you to work harder and become a better actor and person. But there are few who inspire you in the way Tana Hicken inspired me. When I worked with her on Lost in Yonkers at Theater J, I was young (a Sophomore in High School) and I was very intimidated by the two female forces I was going to be sharing the stage with. I walked into the first reading of the play with many fears and trepidations. Not only would I be working with Tana, but Holly Twyford was playing the role of Bella in the play. Tana introduced herself to me that first day. She took the time to ask me about who I was, where I came from and what I wanted to be. She kept doing this throughout the rehearsal process, these check-ins. But they were more than that. I have never worked with someone who was so genuinely interested in my hopes, my aspirations, and my future. One day, I got to the theater about three hours before a show and the first hour it was just me backstage, on my laptop doing school work. But Tana came about two hours early and she came in and saw I was there. We talked and talked for about an hour, until everyone else came in and filled the dressing rooms and joined in our conversation. She was so full of joy and honest appreciation for the people around her and what they brought to the world. She had an interest in them. That’s what was so incredible about Tana to me. Even in the later stages of her career she was still so interested in people, and still studying them. Obituary in The Washington Post by Emily Langer on August 20, 2o14. ‘4000 Miles’ star Tana Hicken: ‘This may be my last play’ by Nelson Pressley in The Washington Post on March 22, 2013. 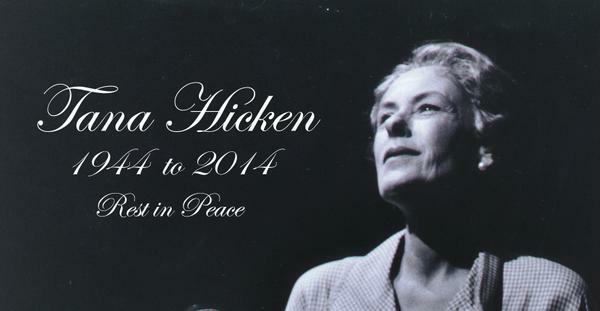 A Tribute to Tana Hickens by Bill Largess on theatreWashington. I had the privilege and good fortune to meet Tana when she so graciously accepted playing the role of Henrietta Szold in a one- act play written by her daughter, Catlin Bell, for the Jewish Museum of MD. Catlin and I co-directed the production. Tana was such a pleasure to work with and her intense curiosity, intelligence, kindness and wit was extraordinary. There can be only one Tana, irreplaceable and the loss to her husband , Donald, and get daughter, Catlin, must be immeasurable. My heart goes our to them both and to those who knew her and those who benefited from seeing her live on-stage. Truly stars in the universe dimmed when Tana flew by for her next great entrance that will lights up the sky.